It was a crisp autumn morning last Saturday. Temperatures had dipped below freezing for the first time this season and the sky was a clear and deep blue color. It was a day of many photowalks all over the world yet I choose to do a drive in southern Onondaga County along Route 20 near LaFayette, New York with the Syracuse Photographers Association. Oh, there was plenty of walking as we visited three different apple farms. Southern Onondaga County is also know as Orchard Valley and has several apple orchards. We started the photo drive at O’Neill’s Orchard. O’Neill’s has a small store with landscaping out front which had felt the effects of the frost from the night before. O’Neill’s Orchard on Route 20 near LaFayette, New York. It has been a tough year for apple and other fruit growers all over North America. The unseasonable warm weather last March brought out blossoms on the fruit trees very early and was followed by two freezing nights. Owner Keith O’Neill confirmed his orchard had lost eighty percent of the crop as he sat behind the counter in his store. He told us about a view up in the orchards behind his store but there were no apples anyone could pick from it. What was left of the apple crop was packaged on the store’s shelves or in crates along the back wall. After enjoying some apple fritters at O’Neill’s, we moved down the road a bit to a different kind of apple product at the Beak & Skiff Distillery where they make artisanal vodka from apples. Beak & Skiff Distillery on Route 20 near LaFayette, New York. Being early in the morning, we decided to take in the spirited view instead of the vodka. Actually, the view of the valley was the draw here. I would estimate the tree colors were about seventy-five percent changed as I looked north towards Syracuse up the valley. The nearby orchard had evidence of this year’s low apple crop production. On the ground under the trees was littered with decomposing apples not good enough to be harvested. 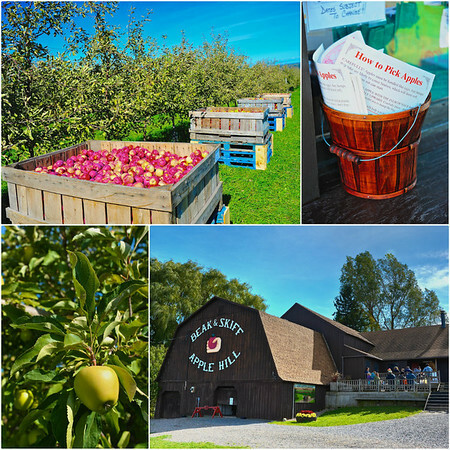 As morning turned to afternoon, we visited the Beak & Skiff Apple Farm which is the largest apple orchard in the county. There were hundreds of people here enjoying the warm and sunny day. Tractors pulled trailers loaded with families to the apple orchards to pick Golden Delicious apples. The greenish yellow fruit was the only trees left bearing edible apples. That did not stop people from climbing supplied ladders to fill bags and bags of them to bring home. Beak & Skiff Apple Farm near LaFayette, New York. Last week, I heard about a blogging event by Robin over at Life in the Bogs calling for people to take a photowalk between October 8th and the 14th. Bloggers would then post their thoughts and photos from their walk and share the link here: Let’s Walk. Robin was kind enough to allow for not just walking but biking, driving and other kinds of transportation as long as it involved the process of photographing the journey. This entry was posted in Weekly View and tagged 28-300mm, apple, autumn, beak & skiff, cone, crates, decay, distillery, empire, farm, flowers, golden delicious, honey, landscape, man, new york, nikon D700, o'neill, orchard, owner, raw, trees, vodka, vr. Bookmark the permalink. It’s this time of year when I get jealous of the Fall season that Florida doesn’t have. Apple picking sounds like a lot of fun. Btw – those views from Beak & Stiff Distillery are amazing. Rachel, you are always welcome to visit. I know I visit Florida enough and thank you for your comments. A beautiful and delicious walk you went on, Scott. Fall is a gorgeous and generous Season and I love picking apples, we have the boscop and gravenstein sorts. I wonder what kind of apple treats you will taste this week ? Love your mosaics. Getting some apple crisp tonight couple with vanilla ice cream. Yum! What are your favorite apple treats, Isa? I’m shocked to learn that some farmers lost 80% of their apple crop. Yes, the crazy Spring weather really devastated the crop. It has far reaching effects beyond the farmers. Usually in O’Neill’s store there would be 3 or 4 people working. Instead, the owner and one other person cooking the apple fritters were there. Workers who count on harvesting the apples also had their season cut short. Not to mention the higher prices of the apples which did survive. Your photowalk idea gave an added element of fun as I was photographing. It was kind of like being on assignment as I looked for story elements to my journey. 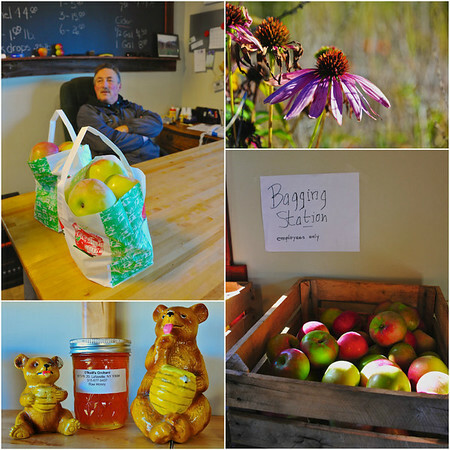 Scott, the Autumn colors are so beautiful in your area and I do love the photos of Beak & Skiff Apple Farm. It has been a while since I visited an apple orchard. The colors have been getting a bit more intense this week with cold nights and warm days. I hope to get out this weekend to photograph those to share next week. Thank you for your comments, Nye! Mmmmm apples. As you know I really prefer summertime to autumn, but fresh apples are a huge part of what I do like about autumn! Great way to spend a day. I didn’t make it to any orchards this year, as many local places seemed to have similar issues with their crops this year. I hope you get your apple treats!